Makes loud voices quieter, and quiet voices louder. 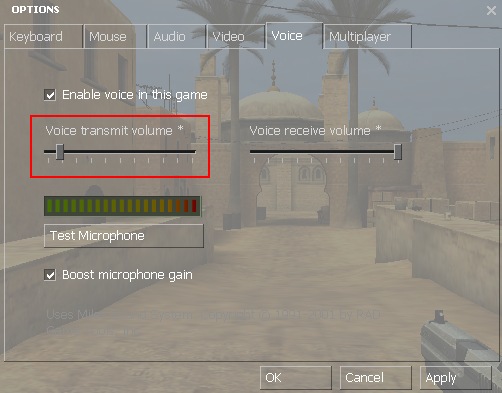 It will attempt to adjust everyone's microphone volume to be at the same level. Extract autogain.zip to your addons directory. Currently supports CS:GO, L4D2, Nuclear Dawn, Insurgency, TF2, CS:S, DoD:S, HL2:DM, and Source 2013 mods. A lot of code was borrowed from SourceMod, CDetour, and SrcDS OSX. Credit and thanks to those projects! Last edited by GoD-Tony; 05-07-2015 at 11:15. Damn you work fast bro. Was awaiting the release of this plugging. Greatly improved the algorithim with a little inspiration from MPC-HC. I'm happy with the end result and this plugin probably won't need any more updates. Last edited by Mitchell; 07-09-2012 at 19:40. That's the single callback from VoiceHook, which you can find more information about in its thread. The rest is pretty straightforward MM:S code. If it's something specific to this plugin then ask away! Otherwise the help forum is a good place to start. yeah i was trying to replace your code with a pitch shift code but i kept getting a long long error or something. i found out that no one else was having this problem, and the code was professionally done. it was a snippet pasted by Asher. Also i really dont see a different in what this does, every one still sounds the same, but this might just be me, cause i havent got any body with a really loud mic on the server lately. yeah i was trying to replace your code with a pitch shift code but i kept getting a long long error or something. i found out that no one else was having this problem, and the code was professionally done. it was a snippet pasted by Asher. I haven't tried that code myself. I recommend posting your error log there if the snippet isn't working for you. Also i really dont see a different in what this does, every one still sounds the same, but this might just be me, cause i havent got any body with a really loud mic on the server lately. If everyone sounds "normal" then that means it's working. It's something you would just install and forget about. Talk in-game. It should barely be audible. Load AutoGain and talk in-game again. Your volume will be adjusted. The same applies to microphones that are too loud, such as when someone is screaming/yelling. Volume will decrease faster than it increases. THis could be used to stop the annoying loop back if the client has a mic close to a speaker, ive tried it but it needs some tweaking, maybe making the volume lower, cause it was repeating a very high pitched noise. It actually does lower the volume quite a bit, and you'll notice that if another client is speaking while those loud sounds go off, they appear to be the same volume. The reason it feels louder is because a higher pitch (or any annoying sound) gives a higher perceived volume, while the actual volume is the same. I'll see if I can make some changes but no guarantees. I wouldn't want it to affect voices. Fun fact: Commercials on TV (loosely) take advantage of this and it's why they always feel louder as well. Last edited by GoD-Tony; 07-11-2012 at 05:56.